Russian officials have expressed the need to establish a domestic credit rating agency. Experts hail it as positive news for the investment climate in Russia, but at the same time, they warn that the country’s own ratings cannot completely replace international ones. Last week, ratings agencies Standard & Poor’s and Fitch downgraded their outlook on Russia’s long-term rating from stable to negative. When making this decision, the agencies were guided by the possible consequences of the sanctions imposed against Russia by the EU and the U.S. The news of the downgrade of the country’s credit rating forecast has caused quite different reactions from Russian officials and experts, and has also acted as a stimulus to the government to look into the possibility of setting up a new international rating agency. Russian market analysts feel confident that the downgrade of the forecast does not directly threaten Russian companies. The reduction of the rating outlook does not necessarily mean that the rating itself will also be downgraded, says Maxim Shein, an investment analyst at BCS. “Moreover, major investors are no longer guided only by the ratings agencies,” he adds. There are about 100 rating agencies in the world. They are usually divided into international and domestic agencies. Historically, the international agencies are registered in the United States. This is because American investment funds are considered the major players in world capital markets. The most influential international rating agencies are Standard & Poor’s, Moody’s, and Fitch Ratings. 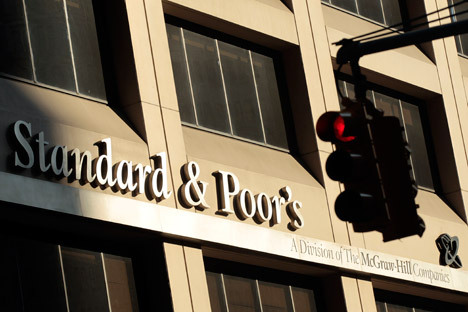 Maxim Petronevich, deputy head of the Center for Economic Forecasting, was similarly bullish: “The negative rating steps taken by Fitch and S&P are not accompanied by any significant deterioration of the situation in the banking system. Limits on raising funds from abroad are likely to remain unchanged,” he said. However, quite a different sentiment prevails in the government sector. Russian officials interpreted the rating downgrade as a direct threat to the country’s investment climate, which could serve as a precondition for foreign investors to withdraw from their Russian assets. “We need to think about creating our own credit-rating agencies at last, so as not to depend on credit-rating agencies biased towards foreign governments,” Federation Council Speaker Valentina Matviyenko announced yesterday, reports Iterfax. First Deputy Prime Minister Igor Shuvalov had said the same thing the day before. “We are not going to depend entirely on the rating agencies, whose names are known to everyone,” Mr. Shuvalov was quoted by RIA-Novosti as saying. According to Mr. Shuvalov, Russian companies engaged in creating credit ratings have already joined a project in China – one that is involved in the development of a new network of international agencies. The Deputy Prime Minister stressed that this would be a completely independent system. The establishment of a domestic credit agency is positive news for Russia. This opinion is shared by Chris Weafer, founding partner of Moscow-based consulting agency Macro Advisory. According to him, the main advantage of the domestic agency is that it would allow the number of companies that can get a place in the credit rating to be expanded. International rating agencies tend to cover the credit worthiness of large companies, while a domestic agency may allow small and medium businesses to get an assessment, thus helping to attract investments. Many countries have their own domestic rating agencies today. In Russia, there are several such companies, which create ratings that take into account the specific economic features of the country. The best-known among them are Expert RA, Moody's Interfax Rating Agency, National Rating Agency, AK & M, and RusRating. Nevertheless, the establishment of a domestic agency cannot replace the influence of a global rating agency. “This will never become a full substitute,” warns Mr. Weafer.